Department of the Environment All State Agencies Recycle (All StAR) Recycling Coordinator Training January 17, 2012. 2 The Law § 9-1706. Recycling plan for State government (a) In general. The Office of Recycling, in cooperation with the Department of General Services and other State agencies, shall develop a recycling plan that reduces by recycling the amount of the solid waste stream generated for disposal by the State government by at least 20 percent or to an amount that is determined practical and economically feasible, but in no case may the amount to be recycled be less than 10 percent. (b) System for recycling aluminum, glass, paper and plastic. -- By July 1, 2010, the recycling plan under subsection (a) of this section shall include a system for recycling aluminum, glass, paper, and plastic generated for disposal by the State government, including the placement of collection bins in State-owned or State-operated office buildings in locations in the State where it is determined to be practical and economically feasible. (c) Implementation. 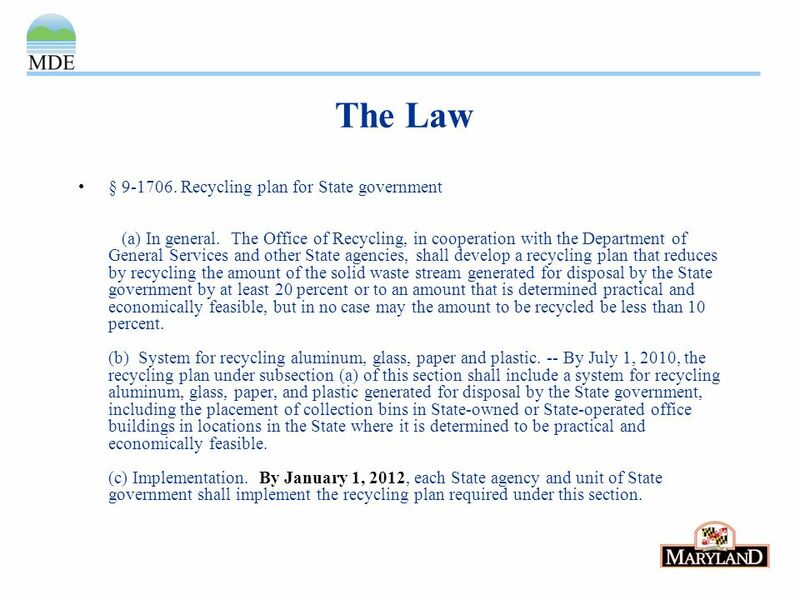 By January 1, 2012, each State agency and unit of State government shall implement the recycling plan required under this section. 3 The Agency Recycling Coordinator The agency recycling coordinator should be responsible for tracking and reporting waste and recycling tonnages. The agency recycling coordinator must be someone within the agency who has final authority for the collection of solid waste and recycling. 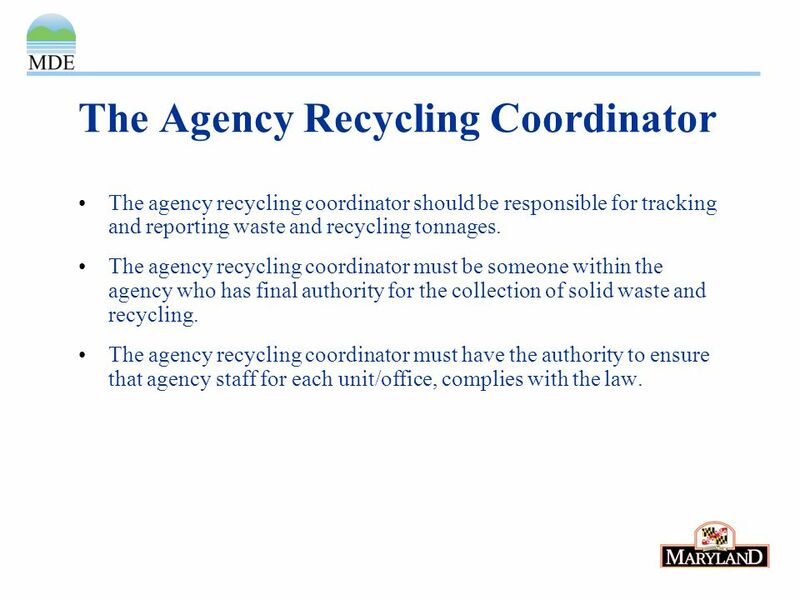 The agency recycling coordinator must have the authority to ensure that agency staff for each unit/office, complies with the law. 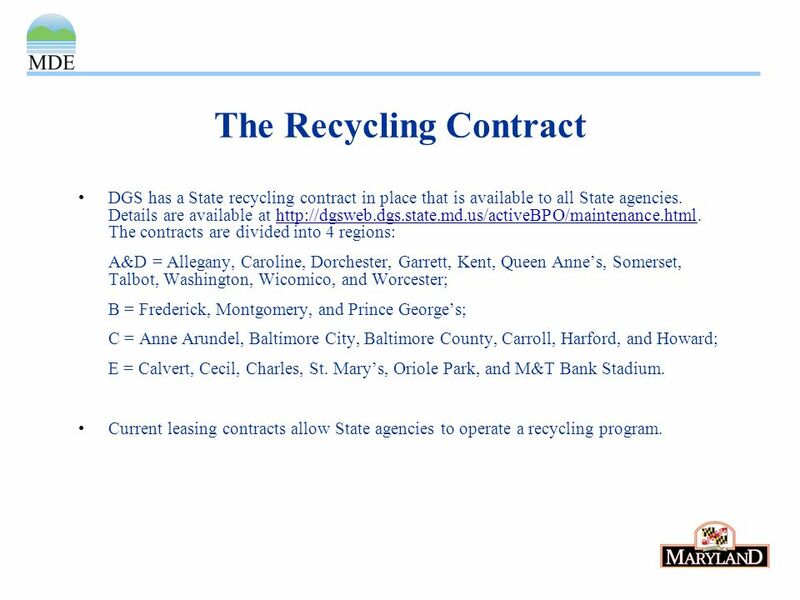 4 The Recycling Contract DGS has a State recycling contract in place that is available to all State agencies. Details are available at http://dgsweb.dgs.state.md.us/activeBPO/maintenance.html. The contracts are divided into 4 regions:http://dgsweb.dgs.state.md.us/activeBPO/maintenance.html A&D = Allegany, Caroline, Dorchester, Garrett, Kent, Queen Annes, Somerset, Talbot, Washington, Wicomico, and Worcester; B = Frederick, Montgomery, and Prince Georges; C = Anne Arundel, Baltimore City, Baltimore County, Carroll, Harford, and Howard; E = Calvert, Cecil, Charles, St. Marys, Oriole Park, and M&T Bank Stadium. 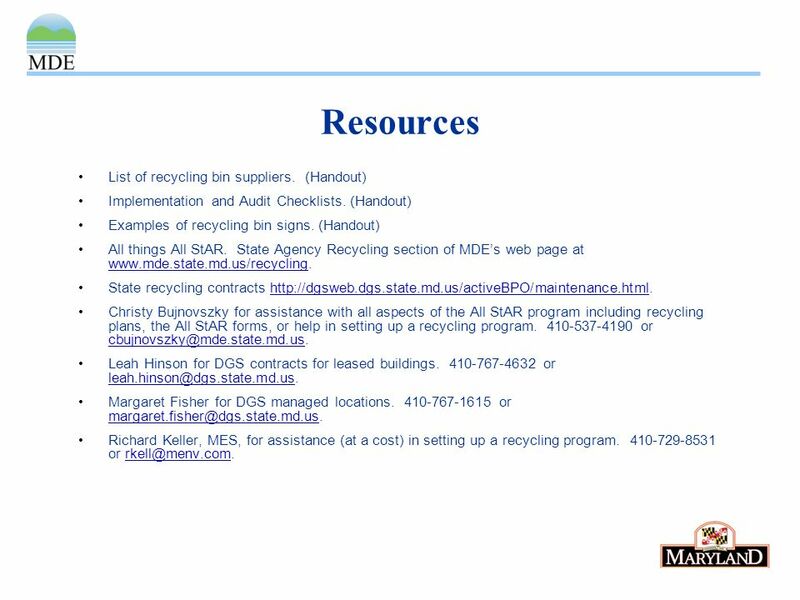 Current leasing contracts allow State agencies to operate a recycling program. 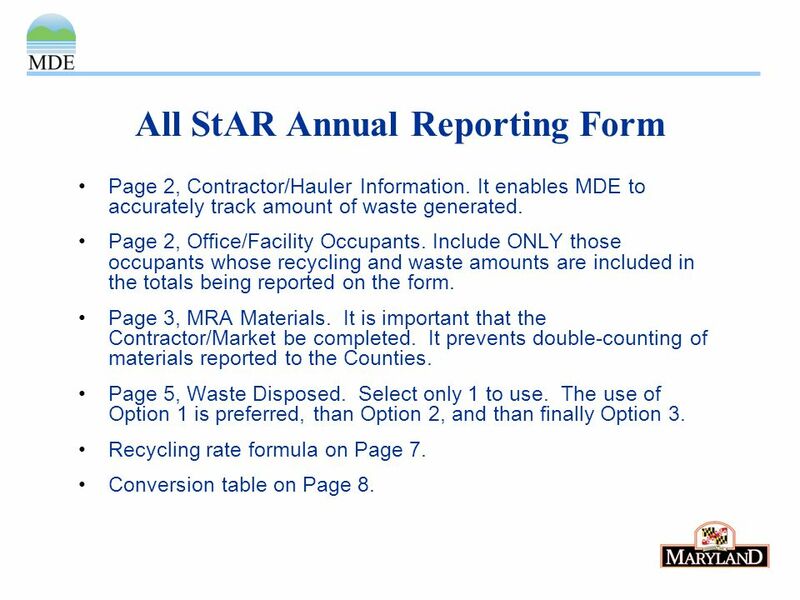 5 All StAR Annual Reporting Form Page 2, Contractor/Hauler Information. It enables MDE to accurately track amount of waste generated. Page 2, Office/Facility Occupants. Include ONLY those occupants whose recycling and waste amounts are included in the totals being reported on the form. Page 3, MRA Materials. It is important that the Contractor/Market be completed. It prevents double-counting of materials reported to the Counties. Page 5, Waste Disposed. Select only 1 to use. The use of Option 1 is preferred, than Option 2, and than finally Option 3. Recycling rate formula on Page 7. Conversion table on Page 8. 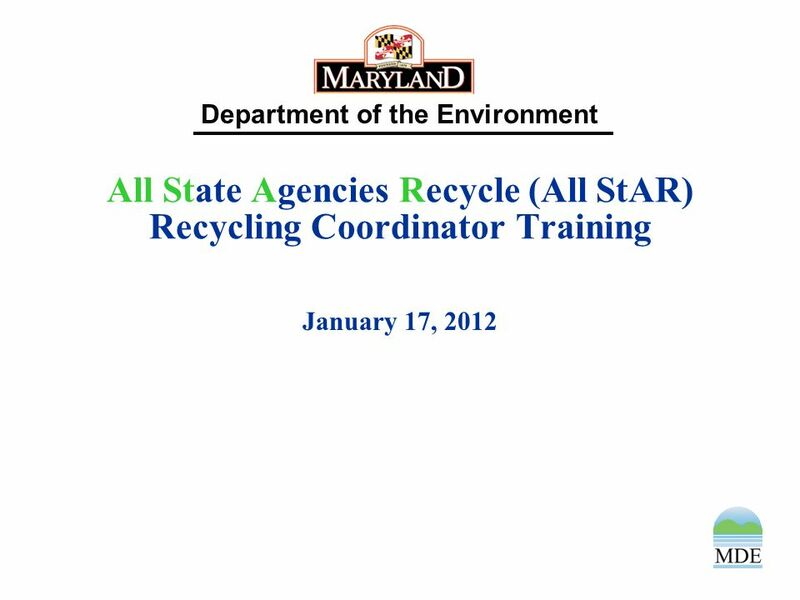 Download ppt "Department of the Environment All State Agencies Recycle (All StAR) Recycling Coordinator Training January 17, 2012." A Collective Voice for Rural Maryland. Where is Rural Maryland? 18 Counties Southern: Calvert, Charles & St. Marys Southern: Calvert, Charles & St. Marys. Maryland Department of the Environment Restoration and Regulation Discussion Presented by: Wetlands and Waterways Program Maryland Department of the Environment. Hydrologic & Hydraulic Analysis Hydrology – amount of water, minimum 2-, 10- and 100-year storms. (ultimate development). Hydraulics – how the water moves. Maryland Assessment Group Conference November 21, 2013. The Construction and Energy Technologies Education Consortium (CETEC) … is a single training point-of-contact for Marylands Construction and Energy industries. MSFW Analysis - Maryland National Center for Farmworker Health. Department of the Environment Water Use and Appropriation of Maryland’s Waters. Center on Budget and Policy Priorities cbpp.org Financial Assistance & the Affordable Care Act October 29, 2013 Tara Straw Center on Budget and Policy. Dale P. Hawks Maryland State Statistician 1. THERE’S HISTORY HERE The first Census of Agriculture was conducted in 1840 in 26 states and the District. TRANSITIONING IN MARYLAND Walter E. Varner State Coordinator, Neglected & Delinquent Programs Maryland State Department of Education 2004. The Municipal Bond Market in the Aftermath Municipal Bond Club of Baltimore September 25, 2008 Presented by: Anirban Basu, CEO Sage Policy Group, Inc.
Cancer Disparities: Overview, Emerging Research Issues and Models in Prevention, Diagnosis, and Treatment Claudia R. Baquet, MD, MPH Associate Professor. ND Annual EDUCATORS RECRUITMENT FAIR The Eastern Shore Consortium for Diversity, Excellence and Equity invites you to its 2 nd Annual Educators. Career and Technology Student Organizations An integral part of CTE success William Nottage, State Director DECA/FBLA Division of Career and College Readiness. 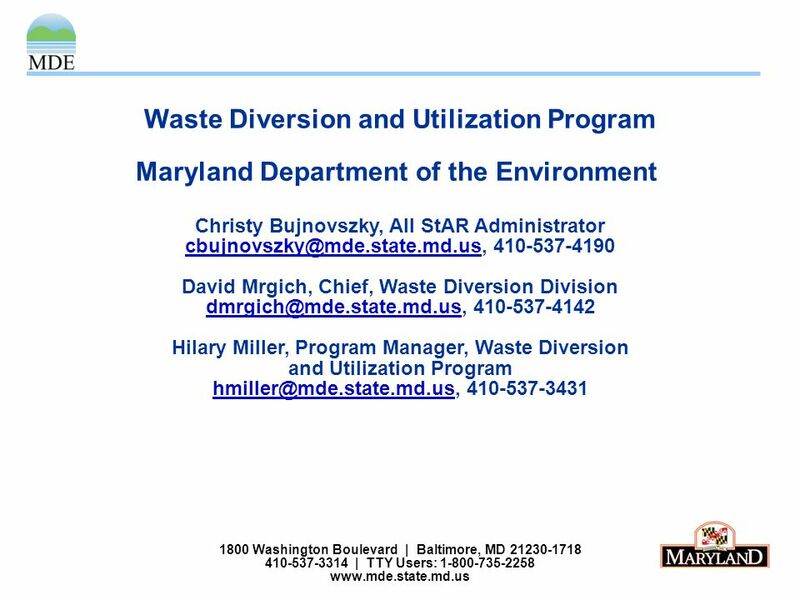 November 6 th – MWCOG GIS Committee Meeting Automatic Synchronization of Maryland Address Data Ashley Lesh Buzzeo & Melanie Ruff Towson University Center.